Welcome back from the long weekend, friends! I hope you all had a weekend of beautiful weather, fun and relaxation. That’s pretty much what our weekend consisted of, and I’m missing it already. I’ll be sharing a recap Thursday! Onto this week’s recipe. Does anybody else ever struggle with cooking chicken to make it different and not so bland? I’ve gotten pretty good at this over the years, but I still go through spells when I don’t feel like making one of my tried and true recipes. I came across this recipe on Pinterest (where else, right? ), and it was just what I was looking for. I’ve concocted several chicken recipes over the years that include a cracker crust, so I can’t believe it never occurred to me to add Ranch dressing. Duh! 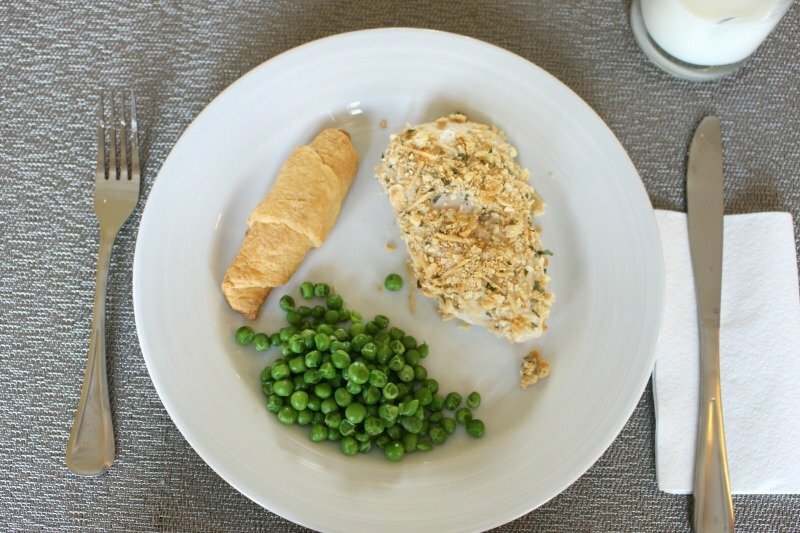 This makes for an easy, quick and filling weeknight meal, and we had two chicken breasts leftover for lunch the next day. Enjoy! *Note: The measurements below differ from the original sourced recipe. 1. In a sealed Ziploc bag, crush Ritz crackers by hand or with a rolling pin. Add Parmesan cheese and parsley flakes. 3. Bake in a 400 degree oven for about 20 minutes, or until the top is golden brown. 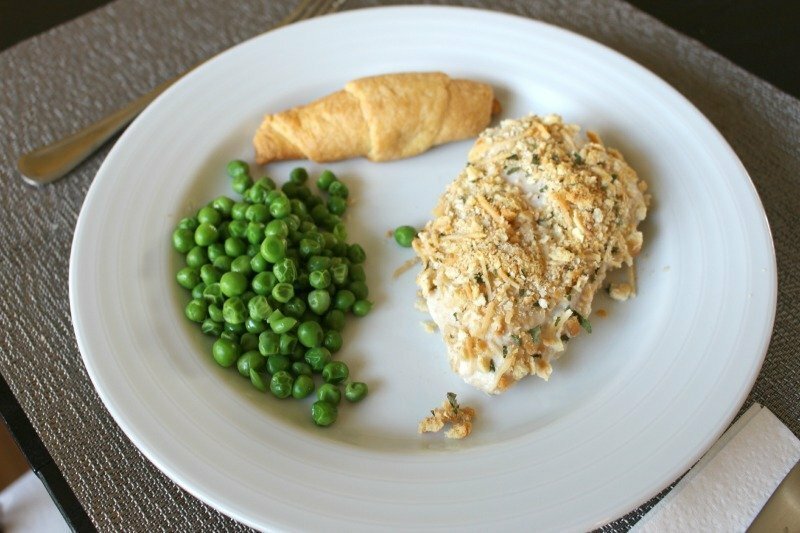 The crunch is definitely the best part of this chicken! And, thank you! My mom custom-ordered it for me a couple Christmases ago. I especially love using it to bake during the holidays. Right?! It really never occurred to me either until recently. It's much easier on my hands that's for sure. 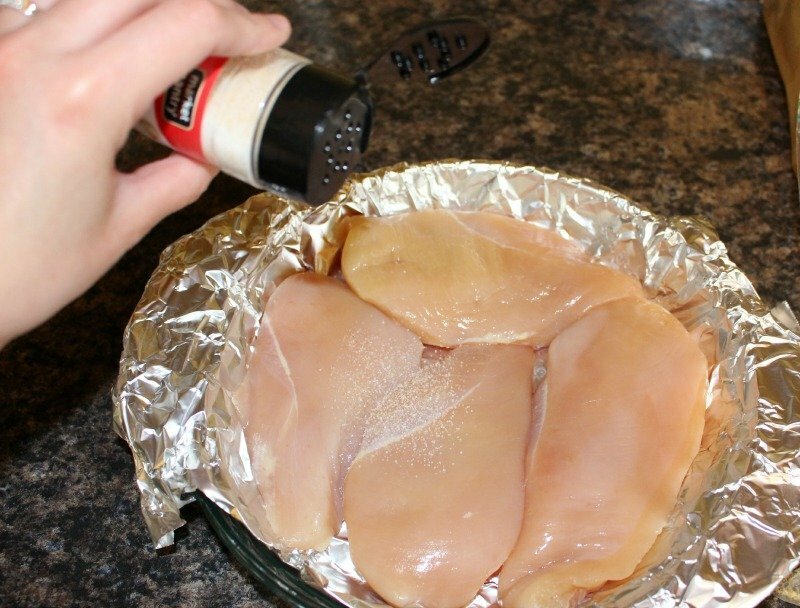 The crunch definitely adds some good flavor to the chicken. And, thank you! My mom had that custom-made for me a couple Christmases ago. Ah, I'm so glad! Isn't that pasta the best? And, thank you – it was a gift from my mom a couple Christmases ago. Yes! It's such an easy and delicious combination. I need to try out Panco-covered chicken! This looks absolutely delicious.We've tried panco covered chicken but never crackers. Adding that to the list! My grandmother totally use to make salmon cakes with a ritz cracker crusts on it! That looks soooo good!! Oh gosh, anything with parmesan and ranch you can just count me in! 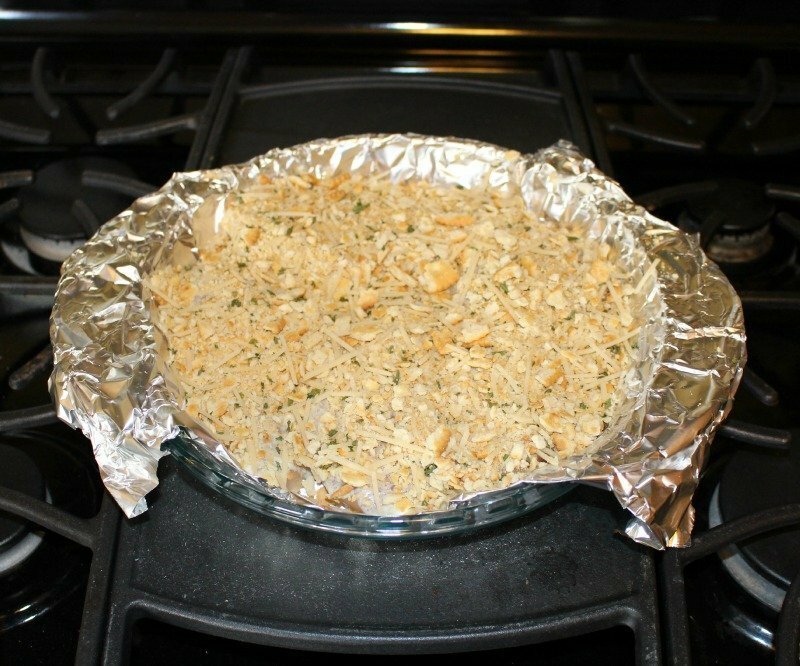 This looks delicious and I love that it uses crackers – so easy! Adding ranch probably makes this dish amazing!! yummmm that looks so good! This looks amazing! I totally made your Pesto Feta pasta this weekend, so good! Your rolling pin is too cute! That looks really good! And super easy. I'm going to have to try it out. Thanks Karly! This looks amazing and easy! I love chicken with a crunch on it 🙂 And love your rolling pin! two things!! 1. this looks delicious! 2. I can't believe I never thought to use a rolling pin to crush up crackers – doh!!! This sounds so delicious! Lately I've been loving chicken that is breaded or has some kind of crunchy texture! 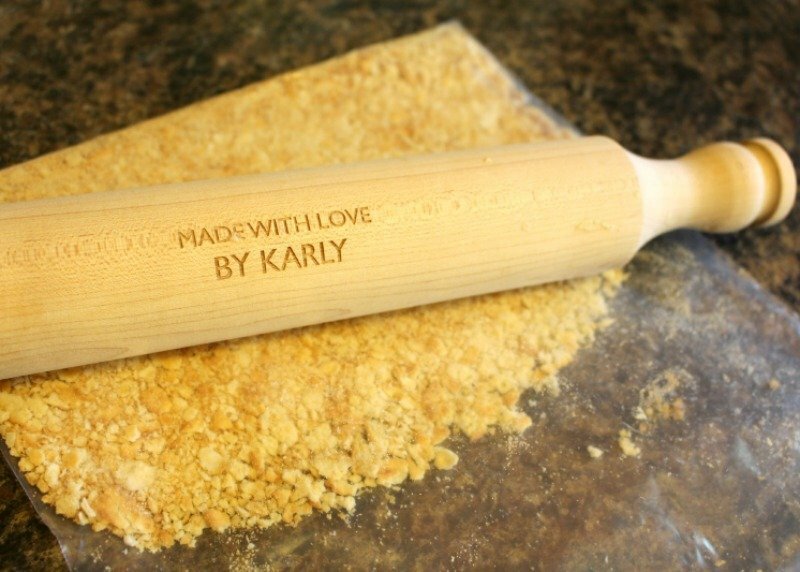 Also– your rolling pin is so cute! I've never seen one like that before! Looks yummy! Love quick and easy recipes!